It is with great sadness that the Society reports the death of Boat of Garten stalward, Mick Housby. Mick was instrumental in the organisation of the original steam fair at the Boat and was the main individual in asking the Society to participate. Unfortunately Mick couldn’t attend last year srally due to ill health to which he seccumbed the week before this years rally. His funeral too place on Friday 16th July, the day before the rally. Mick will be sorely missed by all. 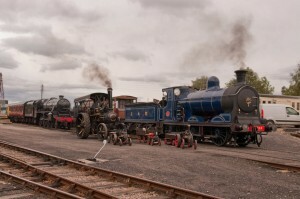 On Sunday, the Steam Fair held a one minute silence in memory of Mick. The start and end of the was indicated by a whistle blast from all the engines in the yard. Must be the year for good weather at our rallies. Okay it wasn’t splitting the bricks but as the pictures show, it wasn’t raining either. I don’t thinkk it will be taken out of turn but I thuink Mick Housby would have been very pleased with everyone’s contribution. bother Railway and Society, to produce a very memorable weekend. 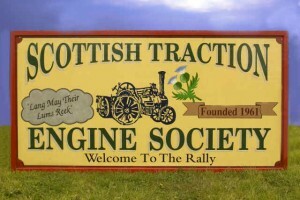 From the Society side, thanks go to M. Smith, the Cook Family, M & D Brown, G Baker & S & H Mair who brought ‘oor Wullie’ 1928 Fowler Road Roller, 1931 Sentinal Waggon & 1925 Fowler Roller, 1914 Ruston Hornsby, Waller & son stationary Steam engine & 1927 Fowler traction engine’ Fraoch respectively. In keeping with a railway theme, Ron Kennedy brought his 1997 5 inch scale steam loco ‘sweetpea’ & the AMSRRC, better known as Mick, Smithy, Arron & Dave ran a 10¼ inch scale loco ‘Tich’ all weekend. Mick Walton also brought a diesel loco for the weekend but no details as yet. If anyone bumps in Ronnie Kennedy with ‘Sweetpea’ just ask him about a mattress !!! !